The Master of the André Madonna, an anonymous painter active in Bruges in the early 16th century, derives his name from a panel in the Musée Jacquemart André in Paris depicting the Virgin, slightly over half-length, against a landscape background. The artist’s style reflects the influence of Jan van Eyck and Petrus Christus as well as that of his contemporary Gerard David. The present work is inspired by The Virgin and Child by Petrus Christus, now in the Szépmüveszeti Museum in Budapest, which in turn looks to Van Eyck’s celebrated Virgin of the Fountain (Musée Royal des Beaux-Arts, Antwerp). In the present composition the artist included four musical angels, two at the bottom and two at the top, that are not to be found in the painting by Christus, and replaced the landscape background with a view of the city of Bruges with the cathedral of Our Lady. 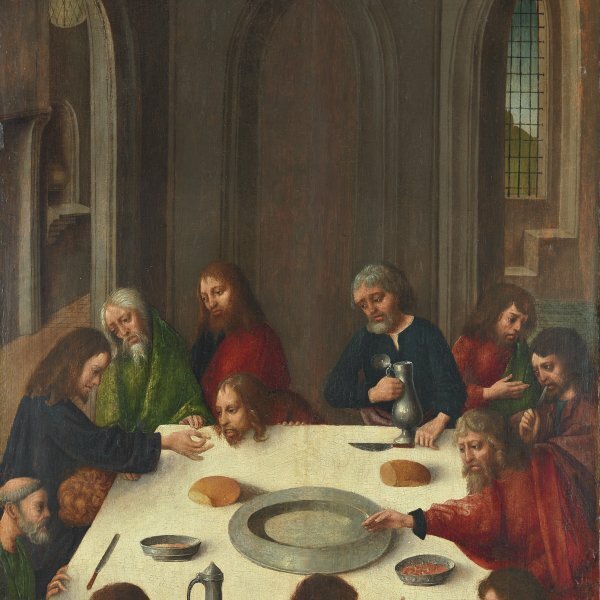 This painting also reveals certain parallels with a panel by Gerard David of the same subject, now in the Metropolitan Museum of Art, New York. This anonymous painter worked in the city of Bruges, as we can tell from the depictions of the city that appear in some of the backgrounds of his paintings. His name is derived from a panel in the Musée Jacquemart-André in Paris depicting a Virgin and Child presented more than half-length before a landscape. The artist was the subject of study by Friedländer, who pointed out the influence of Van Eyck on his work. Among the works attributed to this painter are the Paris panel mentioned above, the present panel and a third, also of the Virgin and Child, in the Everhart Museum, Scranton, Pennsylvania. The present panel has been in the Thyssen-Bornemisza collection since 1930, while the oldest known reference to its whereabouts dates from 1854 when it was in the collection of William Fuller Maitland in Essex, UK. It was later in the collections of R. Langton Douglas and Eduard Simon in Berlin, where it was auctioned in 1929. The Virgin is derived from a Virgin and Child by Petrus Christus in the Szépmüveszeti Museum in Budapest, which in turned was influenced by Van Eyck’s famous Virgin and Child at the Fountain (Musée royal des Beaux-Arts, Antwerp). Petrus Christus’Virgin is depicted standing beneath a semicircular arch with sculptures depicting Adam and Eve on the attached marble columns on each side of the arch. The background is an open terrace giving onto a gentle landscape. In the present composition the landscape has been replaced with an urban view of Bruges, which can be identified by the tower of the Cathedral of Our Lady, among other monuments. In addition, and in contrast to Christus, the present artist included two musical angels in the lower area, playing a harp and lute, and two more flying over the Virgin’s head and carrying a crown that identifies her as the Queen of Heaven. The present panel is notably comparable to a panel of the same subject in the Metropolitan Museum of Art, New York, attributed to Gerard David and dated 1510–15. The various differences between the two works relate to details such as the dense area of grass and flowers in the immediate foreground of this work which is not present in the New York panel, and to the Christ Child’s relationship with the Virgin, which is here shown as more distant. There are other differences evident in the tunics, the details of the angels’ accessories, the chromatic range and the landscape, as well as in the architectural framework into which the composition is set.